The cedula (sometimes spelled as sedula) or the community tax certificate (CTC) is a piece of document issued by the Philippine government to individuals and corporations upon payment of the community tax. It's also an important government-issued document which means that Filipino citizens can present it (as required) when conducting transactions in various offices and agencies of the government. For instance, you can use the cedula as a supporting document when applying for a barangay clearance or a passport. 1. Go to the municipal hall, city hall, or barangay hall within your place of residence and ask for the designated office or window where you can get a cedula or community tax certificate. 2. You will be asked to present a valid ID as proof that you really are the person who is to be named in the cedula you are getting. 3. After checking your ID, the officer in charge will give you a cedula form called an application slip to fill up. The information you need to divulge include the following: full name, complete address of your current residence, citizenship, civil status, birthday, place of birth, height, weight, tax identification number or TIN, and your profession. 4. Submit the form for verification by the officer. You will then be asked to pay for the cedula. Either you pay at the same window or you will be sent to another window. 5. After paying for the community tax certificate, the officer will give you three copies of it. You need to affix your right thumb print as well as your signature on all of the three copies. 6. The officer will get two copies of the cedula. You will receive the original. 1. It may be used as a requirement in applying for some government-issued identification cards like the Postal ID. 2. It can be used as a supporting document when you apply for a passport in the Philippines. 3. You need to present the sedula when you get a barangay clearance or barangay certificate of residency. 4. It's required when you apply for a Postal ID, police clearance, or when you file your income tac return. How much are you going to pay for the cedula? - It depends. If you are unemployed, the amount you pay is usually under 100 pesos. If you are a business owner or an employed professional, the amount you pay would be much higher but it shouldn't exceed 5,000 pesos. 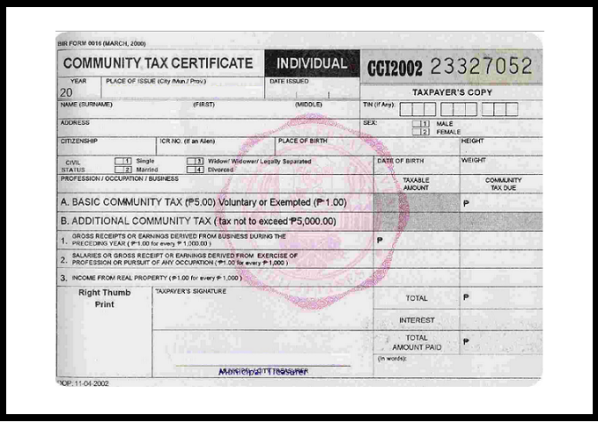 Below is the cedula computation and composition of the community tax you have to pay if you own a business, if you exercise a paid profession, or if you derive income from real estate properties. How long is the validity of the cedula? - Cedula validity is only for a year starting from the date it was issued to you. If it was issued to you on July 21, 2017, then it will expire on July 21, 2018. Can I get cedula anywhere or online? - The answer is no. You can only get it within the municipality or city where you reside. You can't apply for the document online either.